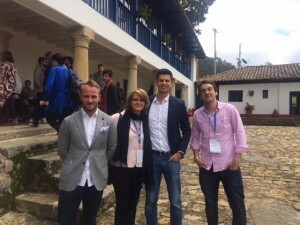 The Negotiation Challenge is a once in a lifetime opportunity, particularly because this year’s competition took place in Colombia, the arena of one of the most important and challenging peace negotiation processes in the last 30 years. As well as being integral to the future of Colombia, these processes will likely shape the negotiation discipline worldwide in the upcoming years. Did you feel well-prepared before the competition? What have you learned during your time at EADA that helped you? EADA’s multicultural, experienced team was more than capable of developing different negotiation styles and tactical combinations to compete at the highest level. The international, multicultural exposure at EADA is one of the keys for negotiation. The MBA modules in the city centre campus and the Residential Training Centre offer a great deal of business simulations and cases in a wide variety of subjects. These cultural scenarios prepare you to deal with conflictive situations. As a MBA student, you are always trying to identify value and negotiate for more. What are the most challenging aspects of negotiation in your opinion? Building trust between parties, overcoming cultural barriers, creating value, improving value and reading people. Do you think that different cultures have different negotiation styles? Negotiation always involves parties or persons with mutual, but differing –and probably conflicting– interests. When there are significant cultural differences, finding ways to bridge those differences and resolve conflicts becomes critical to the goal of negotiating an agreement. Is there a single best way to negotiate? As Stuart Diamond points out in his masterpiece Getting More, negotiation is at the heart of human interaction, and every time people interact, there is a negotiation going on. Furthermore, the author reinforces the idea of how traditional negotiation practices and jargon are being replaced by new tactics and approaches for getting more from each process. For instance, our team supports Diamond´s idea that concepts like rationality, power, walking out or win-win, despite being central to negotiation, are being substituted for emotional sensitivity, relationships, clear goals, incrementally and other core techniques that create better opportunities for negotiation in multicultural contexts. It is evident the field of negotiation is going through a period of transformation due to technological, philosophical and cultural disruptions that are questioning the validity of some of the more traditional negotiation “rules” and standard approaches. If there is no best way to negotiate, how can we improve negotiation skills? It is all about finding your style and developing a learning curve that allows you to reflect and improve in every new negotiation. You need to be both passionate and patient about negotiation, as you often can’t get what you are expecting.